Kansas City, Mo. 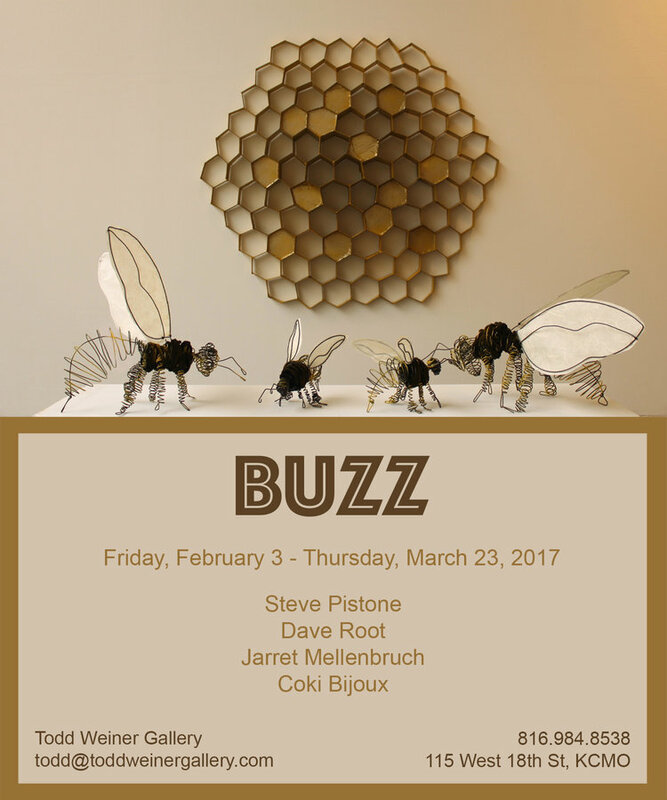 On Friday, February3rd, 2017 from 5-9 PM the Todd Weiner Gallery will host the exhibition opening for BUZZ featuring local artists Jarret Mellenbruch, Dave Root, Steve Pistone, and jewelry shop Coki Bijoux which will run through Thursday March 23rd, 2017. 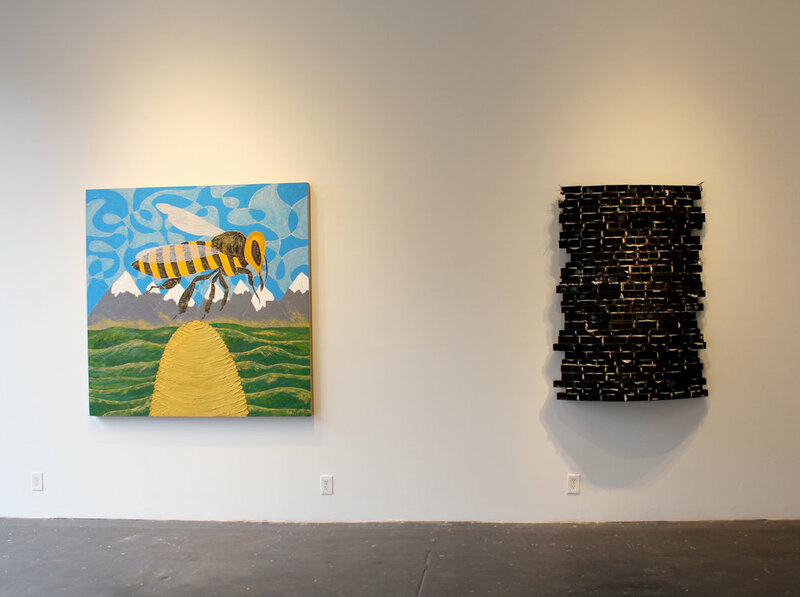 BUZZ will consist mostly of three-dimensional objects complimented by select two-dimensional paintings and line drawings. Unquestionably, the decline in the bee population will have a major impact on our food security. As global citizens, we are tasked with ensuring safety for future generations. Many environmental groups have made significant progress in garnering attention to the bee shortage. Artists, who are often influenced by current social, political, and environmental aspects of culture, lend their perspective to the crisis. Our neighbors in the Bauer building Coki Bijoux jewelry shop will add a selection of pieces from their L'Abeille (Bee) Collection including rings, earrings, necklaces, and bracelets. These handcrafted pieces make for a wonderful Valentine’s day gift! 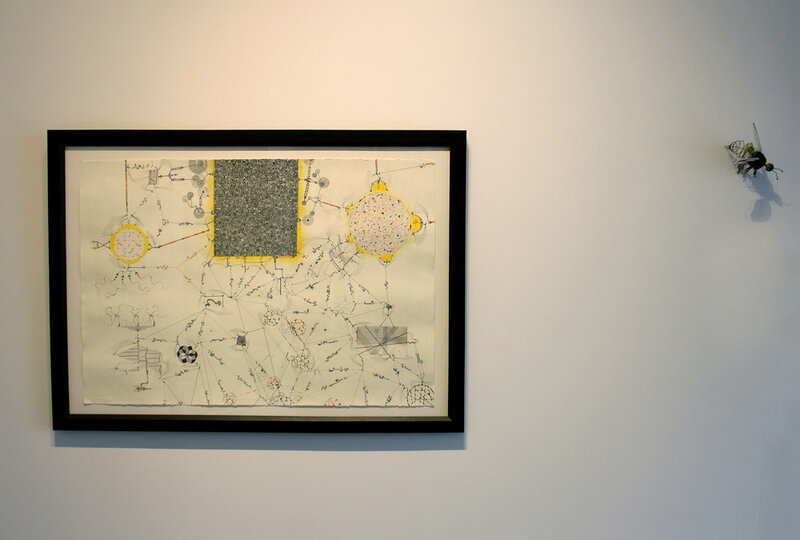 In BUZZ, the artists explores visual understanding of the subject, sustainable solutions, and current visible impacts of impoverished areas. 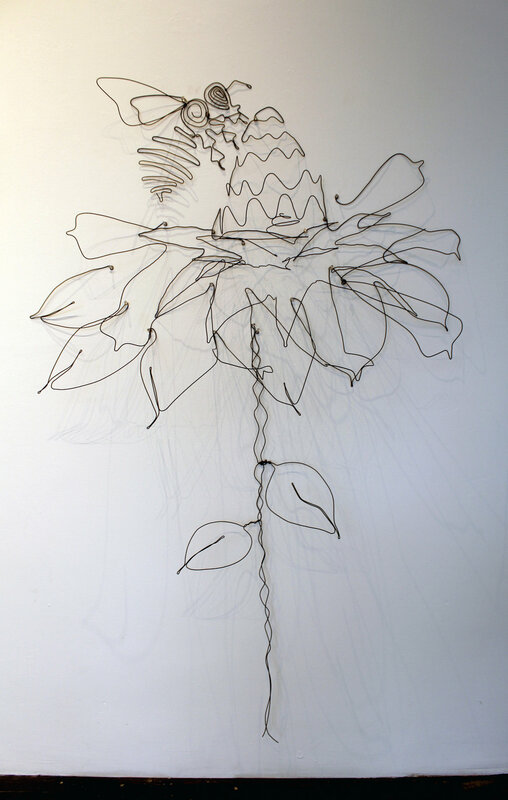 Through a series of wire bee sculptures, Steve Pistone mounts a larger than life hive on the gallery wall. The 3’ x 3’ honeycomb oozes golden paint down the wall. 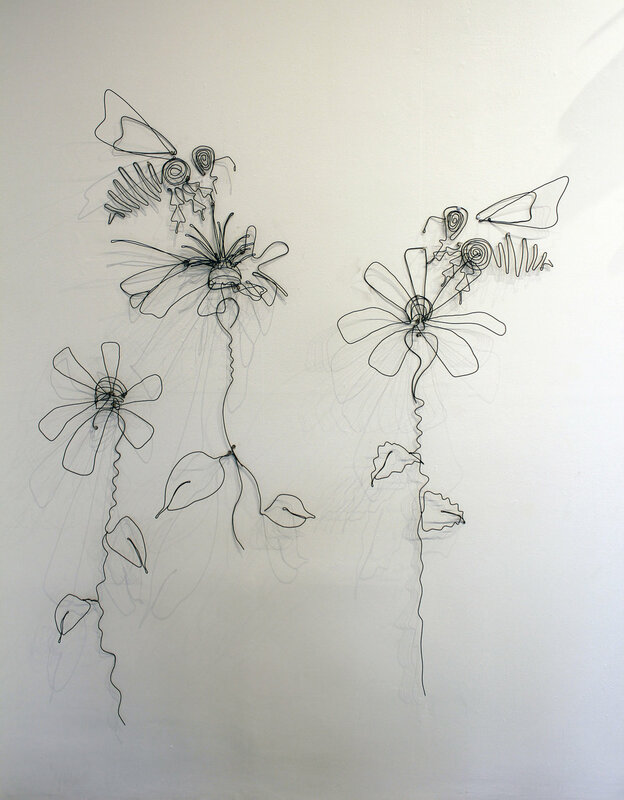 The drippings are honey produced by the worker bees flying around to collect pollen the wire flower sculptures hung throughout the room. As in the natural order of the bee hive, each bee has their own responsibility to keep the hive buzzing. Pistone reflects this in a variety of different sized bees. The most important element to keep the hive running smoothly is the queen bee. Playfully, Pistone adorns the queen bee with a crown to indicate her stature. Jarret Mellenbruch explores a different relationship with the bee crisis. 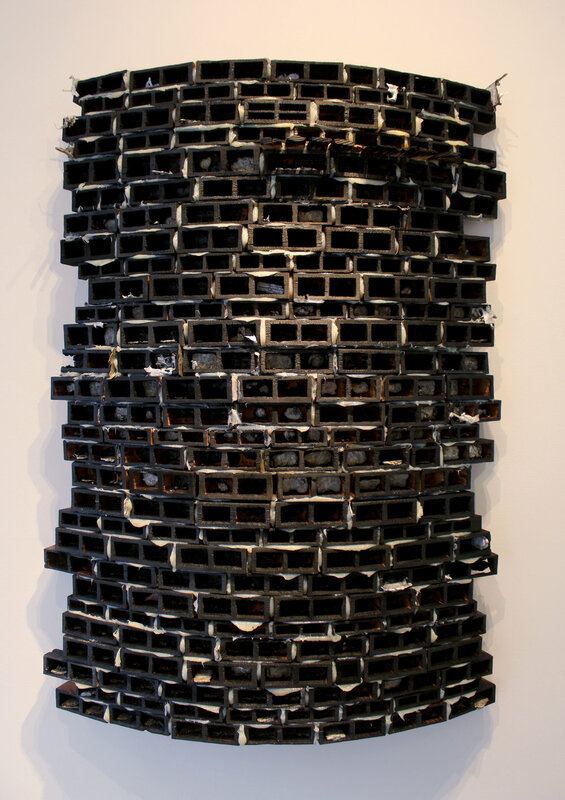 Mellenbruch’s involvement in the show is inspired by his HAVEN series. 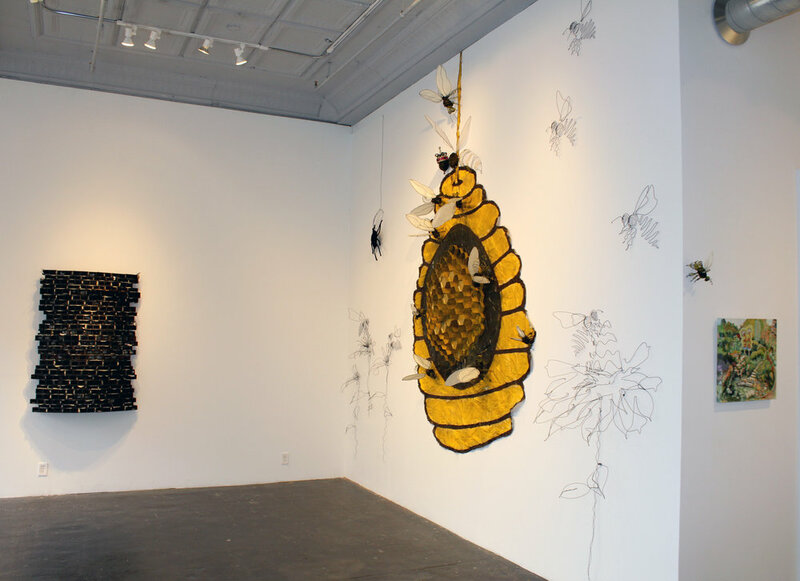 The series focuses on creating functioning beehive sculpture that addresses the ongoing decimation of the global honeybee population due to a series of devastating health crises, including colony collapse disorder. Designed to be a nationwide network of 1000 beehives, Haven provides safe homes for wild honeybees and raises public awareness of the importance of this pollinator, which makes possible 1/3 of the human food supply. Dave Root approached works in BUZZ focusing on the impact of losing honeybees. In his work Favela, he draws parallels to the crowded and unsafe living conditions commonly found in the Brazilian metro area. The recent Olympics and major motion pictures like the “City of God” have drawn attention to favelas that often function as self-contained eco systems. 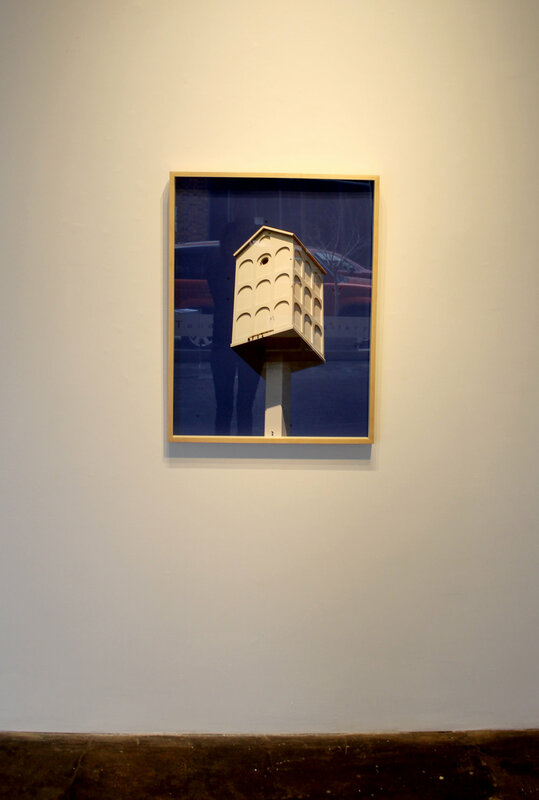 In the exhibition, Root constructs a large hive-like wooden structure comparing the bees in the hive and the humans who inhabit favelas. The structure is striking similar to the mountain side dwellings that stack the Brazilian metro. Root fears that if we do not protect our food supply that we will evolve into a different type of society similar to favelas.